Round Diamond Swirl Wedding Set | Shane Co.
An elegant swirl of diamonds will beautifully wrap around your chosen center diamond and create the perfect, breathtaking engagement ring she has been dreaming of. 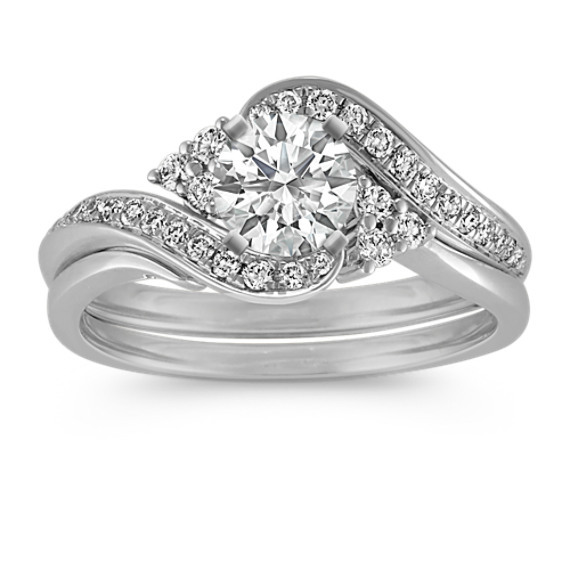 This unique design features an interlocking style of the wedding band tucking under the bridge of the engagement ring to create a gorgeous wedding set. This wedding set is crafted of quality 14 karat white gold and is accented by 32 round diamonds, at approximately .25 carat total weight, that are sure to amaze her.